Wikipedia gives a long winded definition of collaboration, Google’s dictionary comes up with something simple; the action of working with someone to produce something. Its use has grown in our lifetime. That upward blip in the use of the word at the end of the 1940s is due to the second meaning of the word; traitorous cooperation with an enemy. Some of the recent growth is due to the rise of social media and the experiments in new ways of working. What is the benefit of collaborating in a team? In the theory of the wisdom of the crowds, the more people contributing to an answer the more likely you are to get the right answer. In effective collaboration a team of diverse experts bring their perspectives to decision-making. In every major project I’ve worked in the contributions of experts from different fields has been critical to the solution’s success. I will never know as much as the collective knowledge across the company; here are a few examples. Implementing an enterprise social media platform; its use as a service channel by a business investment team became the best use case collaboration to provide a service. I was looking for use cases, but didn’t even know the team existed. Developing social media guidelines; we had legal and risk experts in the room, they had the deep expertise we needed to get it right, but it was a new hire from a non-digital team who pushed us to simplify the guidelines and the language. Social Media Publication Platform; we had experts from IT, business, legal, and digital involved in evaluating possible tools. It sounds a bit like that old trope of six blind men describing an elephant, but in fact we had good discussions and agreed on the solution to be chosen, while understanding the limits and compromises we were making. Translation; we translated some internal messaging via the enterprise social network, with contributors all using their native language and delivering the translated versions back within 3 days. Collaboration can also provide additional capacity, if you work collaboratively you can share resources and even provide coverage in the absence of a colleague. Non-profits have been finding ways to collaborate under cost cutting pressure for years, but it can work within organisations as well. How can you make collaboration effective? Collaboration isn’t easy, and there is a lot in current workplaces that goes against collaboration. A HBR study reports that when teams get above 20 members, have high levels of expertise, are highly diverse, virtual, or are addressing complex tasks, the chances of effective collaboration drop. Collaboration requires trust across a team and a willingness to share knowledge, it’s easy to see that virtual teams might struggle, but the high expertise seems counter-intuitive. Here are some factors to consider when building a collaborative team. When executives a visible and demonstrating a particular behaviour they will be copied. Company cultures often emphasise a task focus, but in companies that emphasise a relationship focus teams find it easier to collaborate along the lines created in the company’s human network. Collaborative teams work better with defined roles and responsibilities, usually the roles can be derived from the person’s expertise, but it pays to specify the responsibilities. You can use a form of a RACI to document responsibilities. When teams have a strong joint purpose and are rewarded for the results of the team’s work their motivation to collaborate rises, yet most companies focus on individual performance and results. If you can’t re-organise your company’s formal reward system look for other ways to reward and celebrate teams that have genuinely collaborated. We’re used to working as individuals, we need to learn new ways of working for the collaborative era. Two techniques that are worth checking are Work Out Loud (WOL) and appreciative enquiry. Whether you use a company enterprise social network, a project tool such as basecamp, or a SharePoint team site, you will need some way for a collaborating team to share their work. If the team is dispersed across locations the tools become vital. I’ve discussed the benefits of collaboration to the company, there are also benefits for individual contributors. For many people working collaboratively is more engaging and more rewarding. It’s also an appealing way of working for tech-savvy employees and millennials. Two groups your company should be trying to attract and retain. It’s a win for everyone. Holacracy is often linked to a boss free work environment, a flat organisation structure, and having the freedom to choose what to work on. The same characteristics are cited by those in favour and against the concept of holacracy. To me those characteristics sound good, I like having autonomy at work. When I studied organisational design we talked about entrepreneurial organisations, machine bureaucracies and ad-hocracies according to Mintzberg’s model. At that point Holacracy hadn’t been invented, but some of the ideas around self-management were evolving. 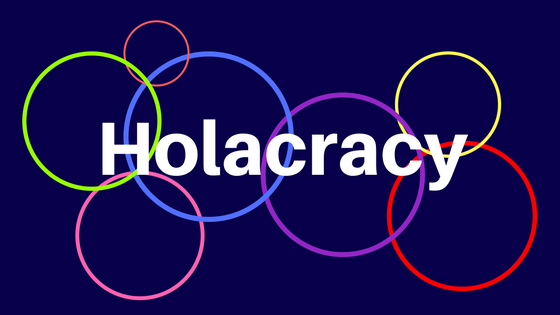 Holacracy is a system of company governance that enables colleagues to self-organise around the work. There is still an organisational structure, but now it’s based on circles of work rather than a hierarchy. Roles are defined, and a person may have be part of more than one circle and fulfil a different role in each. The specific system was developed by HolacracyOne, and has been adopted by around 300, mostly small, organisations. it gets a fair amount of hyper and an equal amount of detractors. There is a decrease in the bureaucracy of planning and approvals that you see in a standard hierarchy, instead there are monthly governance meetings and processes specific to maintain the holacracy. Every company sits somewhere on a continuum from reliability to adaptability. Holacracy enables faster decisions to be made closer to the customer, as a system it is probably going to work best in younger, smaller, creative companies at the adaptability end of that scale. Of course older, larger, regulated companies can (and do) adapt the ideas of self-management into their teams but I think would struggle to deploy a full holacracy at scale. Companies have reported specific quantifiable benefits from using various systems of self-managed teams; FedEx cut service errors by 13% in 1989 for example. But strong results on holacracy are harder to find, that’s partly because it’s early days – we’ve had a hundred years or more of business hierarchies, it’ll take a while to figure this out. Even one of the founders, Brian Robertson, predicts that it will take a few years for a company to embed the Holacracy system and move into working within it in a stream-lined way. Benefits cited are; increased employee engagement, increased adaptability, decreased office politics (although one article regarding Zappos casts some doubt), increased transparency, increased focus on organising around work. It also sounds good, so what’s the downside? HBR published an excellent article “Beyond the Holacracy Hype“, and they point to downsides relating to increased complexity particularly around doing work – if an employee is in multiple roles each with a set of responsibilities then it becomes hard to know where to focus their effort, Zappos went some way to solve this by evolving a “marketplace” that assigned points for work allowing the company to set priorities via the Lead Links (team leads). When someone has multiple roles compensation becomes more complex, as does hiring – including internal hiring. It becomes hard to scale up to complete initiatives that would go across several circles – it’s also hard to do this across departments in a traditional organisation, but it seems the effort of co-ordinating this becomes even steeper in a fully self-managed environment. The Holacracy site claims that over three-hundred organisations currently use their system, of the four on the front page the largest is Zappos – and they are now moving on to become a Teal Organization. The principles of self-management are good; positive for employees which has to benefit customers and the company. Holacracy as a system embeds transparency and forces a focus on the work, but seems to place a burden on the company in terms of added complexity, and it may limit scaling – or need to evolve to enable scaling. However even large, older, regulated, dinosaur companies have been borrowing what makes sense for them and creating hybrids of hierarchy and self-management. It may be a slower track to the company of the future but they’re benefitting from the experiment as well.